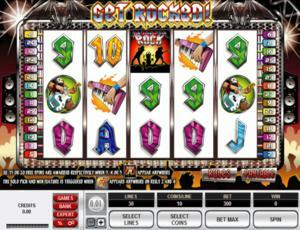 Get Rocked is an online video slot machine game released in August 2009. It is offered exclusively at online gambling casinos powered by Microgaming. This video slot game has 5 reels and 30 pay lines. The theme of Get Rocked is all about an incredible rock band playing to their hearts’ content in a special one-night only rock concert. In the Get Rocked online slot game, you get an exclusive ticket to watch an awesome rock band and get to win prizes at the same time! Many online slots players loved playing this slot game right away as it has an awesome fun factor that will surely entertain you for hours and it can also reward you with generous wins! Get Rocked has a very simple and fun Solo Pick-and-Win Bonus Feature game wherein you simply pick a rock band member to play out his solo number and you will be given a cool bonus prize! Of course, it also has a classic Free Spin Bonus Feature game where you can have the chance to win more without any additional costs! Furthermore, it has a Gamble Feature, which can double or even quadruple your regular wins if you’re really lucky! The Get Rocked online slot game will certainly give you hours of fun and entertaining slot action, and the opportunity to win substantial rewards while enjoying great music played by a very talented rock band! Microgaming online slot games are available to players in 2 formats – download and no-download. Whether you like to download their software first or you prefer to play instantly without the need to download, then Microgaming surely has online slot machine games to accommodate your every slot gaming preference. Get Rocked is a slot game that belongs to the download category, which means you must download first before you are able to play this particular slot game. Get Rocked is created for those who love rock music, and at the same time for those who desire to win some real money while enjoying a round of spins in this light and awesome music-filled slot game. The Get Rocked online video slot game features scatter wins, wild substitutions, a Get Rocked Solo Pick-and-Win Bonus Feature game, a Free Spin Bonus Feature game, a Gamble Feature game, a maximum cash jackpot of $5,000, and a maximum jackpot of 12,500 coins! The quality of the graphics and sound that Microgaming provides is absolutely awesome and fabulous. They have a solid reputation of making the most amazing graphics and realistic sound effects that will truly transport you to “that specific theme” they used in any of their slot games. Most people love to play games incorporated with Microgaming software because they have smooth animation and engaging yet non-interfering sounds. In the Get Rocked online slot game, you get exclusive tickets to enter a special one-night only performance of the Get Rocked band! The symbols are drawn anime style (Japanese cartoons), and the backdrop of the symbols is white, which is guaranteed not to hurt your eyes even if you play for a long time. Awesome animated programming is used on the symbols when you successfully hit winning combinations. The overall graphic design of Get Rocked showcases the setting of a rock band concert, complete with speakers beside the pay line indicators, bright stage lights on top, two gargoyles looking down on the stage, and of course, the audience wildly cheering for their favorite rock band on the lower part of the reels! The constant background music used in this game is energetic rock music. When you manage to form winning combinations, different rock music (with guitars, drums, or keyboard) will be played out. In the Get Rocked Solo Pick-and-Win Bonus Feature game, you get to hear a rock band playing their hearts out with their designated musical instrument. The card deck symbols available in the Get Rocked online video slot game are 9, 10, J, Q, K, and Ace. The regular symbols that you will find in Get Rocked are the Guitar, Bass, Keyboard, and the Drummer. The Wild Symbol is the Lead Singer symbol. It acts as a substitute for all other symbols (except for the scatter symbols) in order to help you complete a winning combination. When you are able to get winning combinations with multiple Lead Singer wild symbols on an active pay line, you will be given varying prizes (refer to the Payout table). If you manage to get the Lead Singer wild symbol to come out anywhere on the 2nd and 4th reels in a single spin, you will activate the Get Rocked Solo Pick-and-Win Bonus Feature game. The Scatter Symbol is the Rock Stage. The scatter symbol is not required to appear in a line (on an enabled pay line) for you to win. The Rock Stage scatter symbol can be found scattered anywhere on the 5 reels, and you are able to form winning combinations as long as there are 2 or more Rock Stage scatter symbols that appear. Your winnings are calculated by multiplying the Rock Stage scatter symbol combination payout (refer to the Payout table) by the total number of coins you’ve bet. If you manage to get 3 or more Rock Stage scatter symbols to come out anywhere on the 5 reels, you will activate the Free Spin Bonus Feature game. Please take note that if you get a scatter win and a normal win, then you are paid out for both of these wins, because the Rock Stage scatter symbol is not required to come out on an enabled pay line for you to win. Scatter awards are independent from pay line awards, and thus they are added to the pay line win. Please take note that if you get any winning combination, you can choose to gamble it in the Gamble Feature game, or you can just continue playing the regular Get Rocked online video slot machine game. If you click the Collect button to collect your winnings, the Gamble Feature game will end, and you will be returned back to the regular Get Rocked online video slot game. • Free Spin Bonus Feature Game – If you manage to get 3, 4, or 5 Rock Stage scatter symbols anywhere on the 5 reels, you will activate the Free Spin Bonus Feature game wherein you will be given 10, 15, or 20 Free Spins respectively. All of your winning combination payouts in these Free Spins are tripled! While playing the Free Spin Bonus Feature game, you can re-trigger the Free Spins by just getting 3 or more Rock Stage scatter symbols (anywhere on the reels), which will award you another set of 10, 15, or 20 Free Spins! The additional Free Spins are included to your remaining number of Free Spins. There is an infinite amount of Free Spins that one can win during the Free Spin Bonus Feature game. Please note that since the Rock Stage symbol is a scatter symbol, your winnings are calculated via multiplying the Rock Stage scatter symbol combination payout (refer to the payout table) by the total amount of coins you’ve bet. Also, you can activate the Get Rocked Solo Bonus Feature game while you are still playing the Free Spin Bonus Feature game; however, the Free Spin multiplier will not multiply your winnings in the Get Rocked Solo Bonus Feature game. Once the Free Spin Bonus Feature game is over, you will be then taken back to the main Get Rocked online slot game, and your winnings from the Free Spin games will be included to your overall balance. • Get Rocked Solo Pick-and-Win Bonus Feature Game – If you manage to get the Lead Singer wild symbol to come out anywhere on the 2nd and 4th reels in a single spin, you will activate the Get Rocked Solo Bonus Feature game. You get to win random amounts as a bonus prize in the Get Rocked Solo Bonus Feature game. In this bonus game, you will be taken to a stage with the Get Rocked Band members. Simply select a band member to play a Solo number. When the band member you chose finishes his solo performance, you will win a random amount as a bonus prize. The amount of coins you’ve bet is already multiplied by the random bonus prize amount given to you, and the number of pay lines activated. The bonus prize you get is included to any regular and scatter pay line wins. Once the Get Rocked Solo Bonus Feature game is over, you will be then taken back to the main Get Rocked online slot game, and your winnings from the Free Spin games will be included to your overall balance. Get Rocked has 5 reels where you may bet on as many as 30 pay lines. The minimum bet is 0.01 and the maximum bet is 0.25 per pay line. You can wager 1 up to 10 coins per pay line bet. Therefore, the maximum bet amount is 75.00 per spin. The maximum payout in the main Get Rocked online video slot game is 5,000 coins per line bet. People who often play online casino games apparently love to stay and play longer on online slot games that have an Autoplay function. Good thing that Get Rocked comes with this function! In Microgaming online slot games, they have 2 game modes – Regular mode and Expert mode. You can have the game spin automatically for you with the Autoplay function that can be found by clicking the Expert button (located at the lower left portion of the game screen). After customizing the Autoplay function to your preferences, just click on the Start button, and the game will automatically spin for you while you just sit back, relax, and enjoy playing this awesome rock band-themed online video slot game!